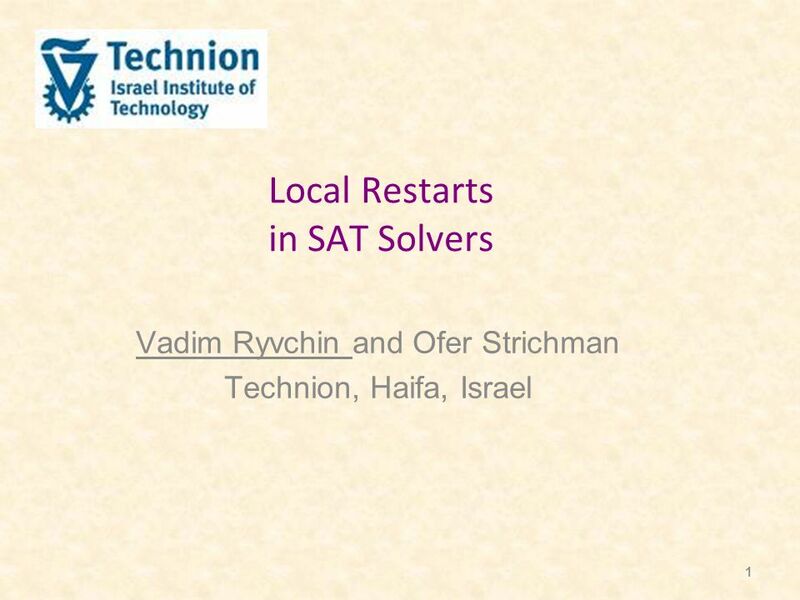 1 Local Restarts in SAT Solvers Vadim Ryvchin and Ofer Strichman Technion, Haifa, Israel. 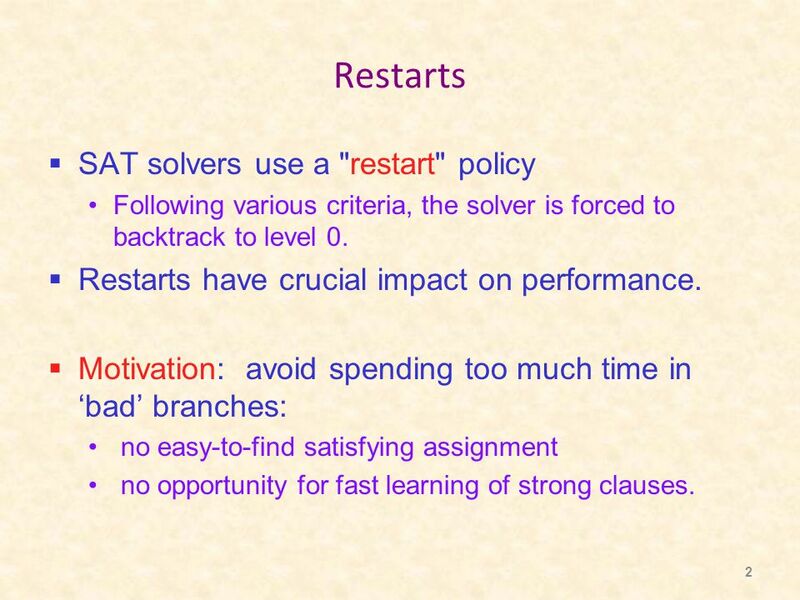 2 2 Restarts  SAT solvers use a "restart" policy Following various criteria, the solver is forced to backtrack to level 0. 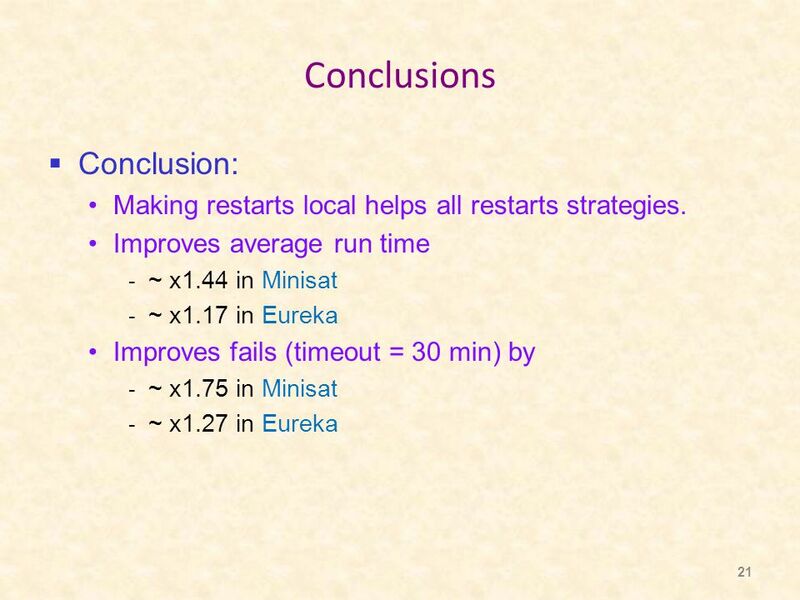  Restarts have crucial impact on performance. 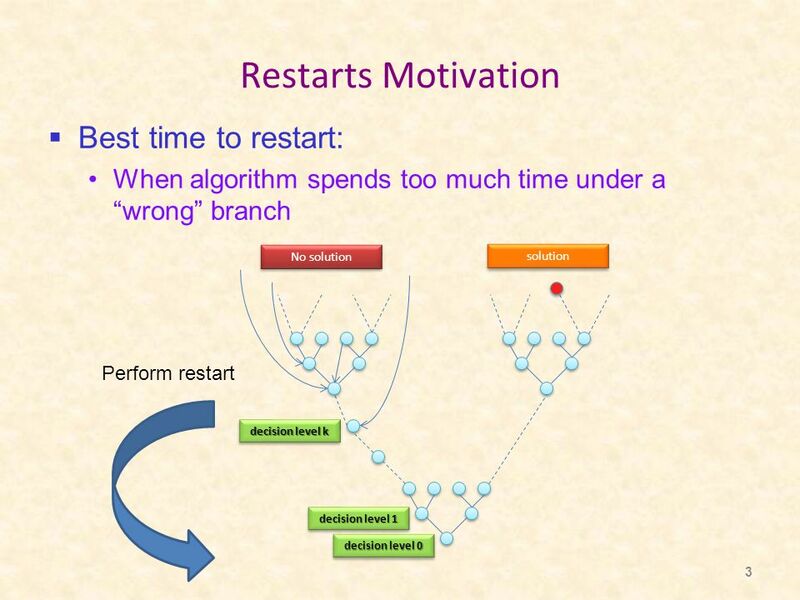  Motivation: avoid spending too much time in ‘bad’ branches: no easy-to-find satisfying assignment no opportunity for fast learning of strong clauses. 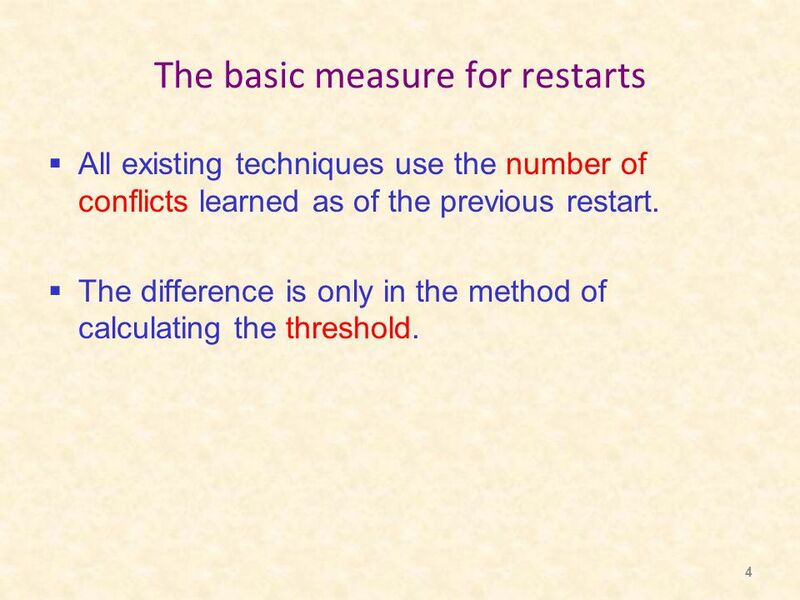 4 4 The basic measure for restarts  All existing techniques use the number of conflicts learned as of the previous restart.  The difference is only in the method of calculating the threshold. 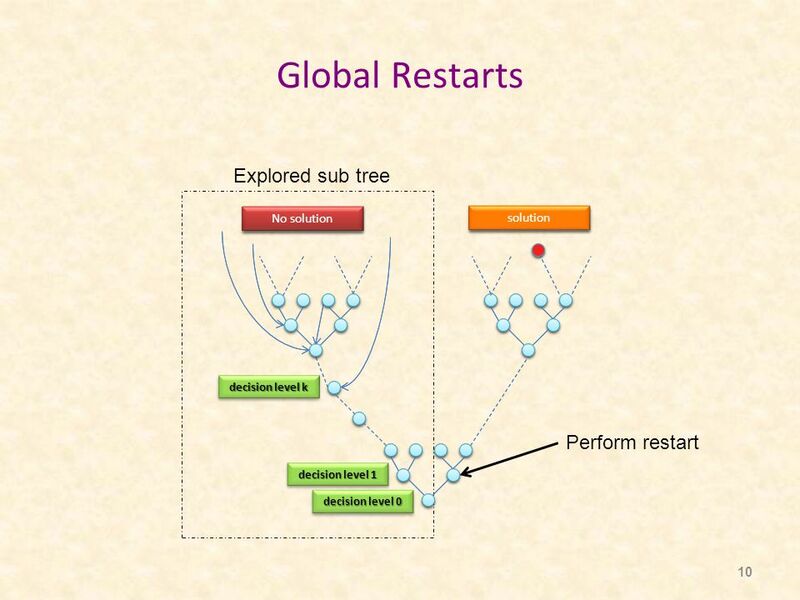 9 9 Global vs. Local  Recall: all techniques measure the number of conflicts as of the previous restart.  This is a global criterion.  Somewhat disregards the original motivation of focusing on ‘bad’ branches. 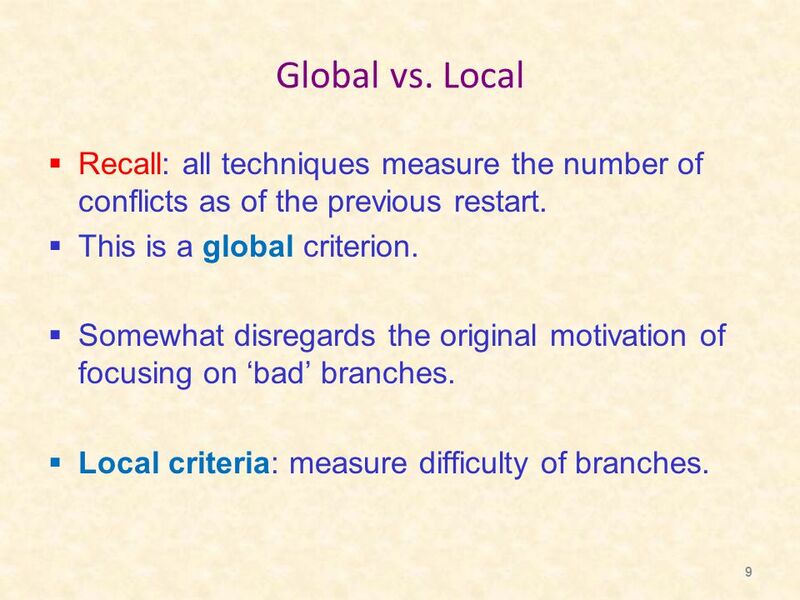  Local criteria: measure difficulty of branches. 12 12 Calculating the number of conflicts under a branch  We worked with the following local measure: Number of conflicts above each level. 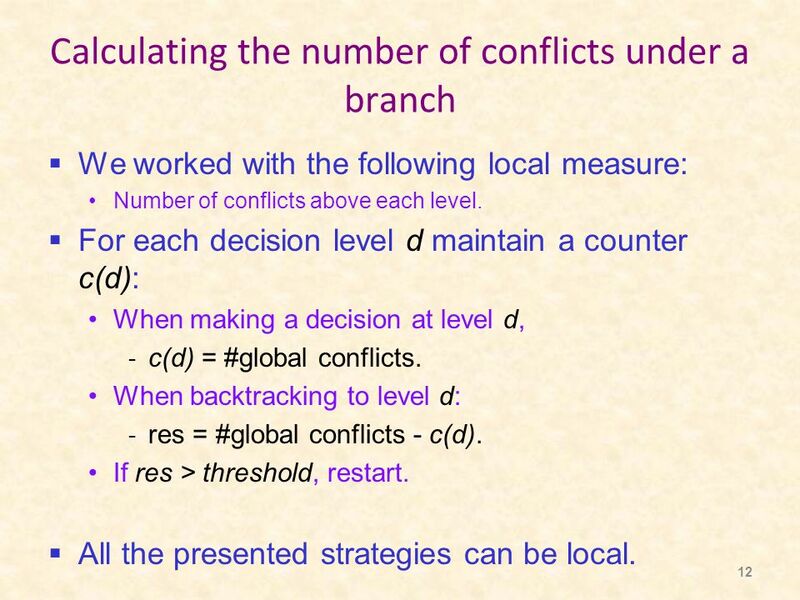  For each decision level d maintain a counter c(d): When making a decision at level d, - c(d) = #global conflicts. 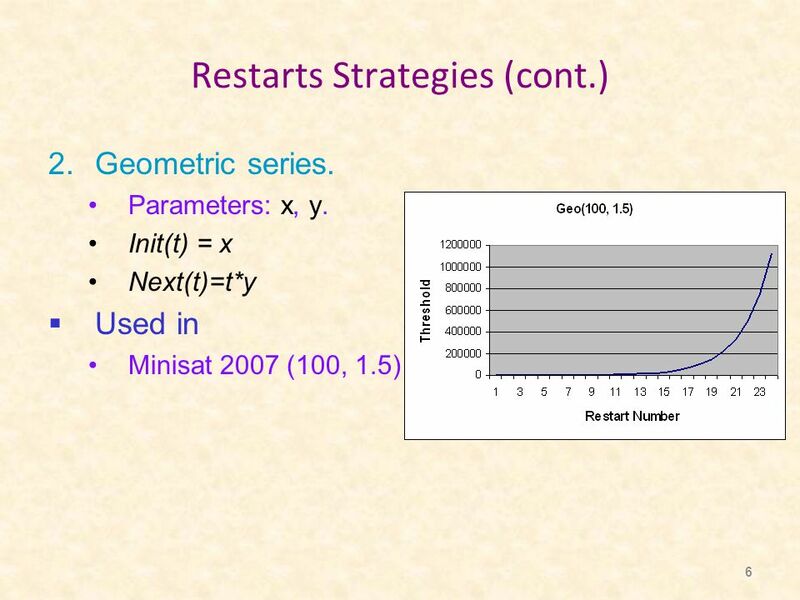 When backtracking to level d: - res = #global conflicts - c(d). 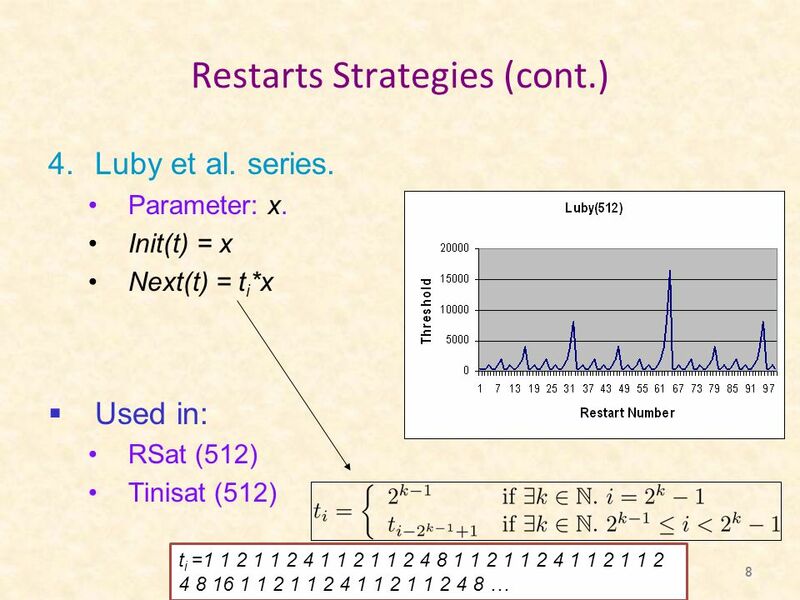 If res > threshold, restart. 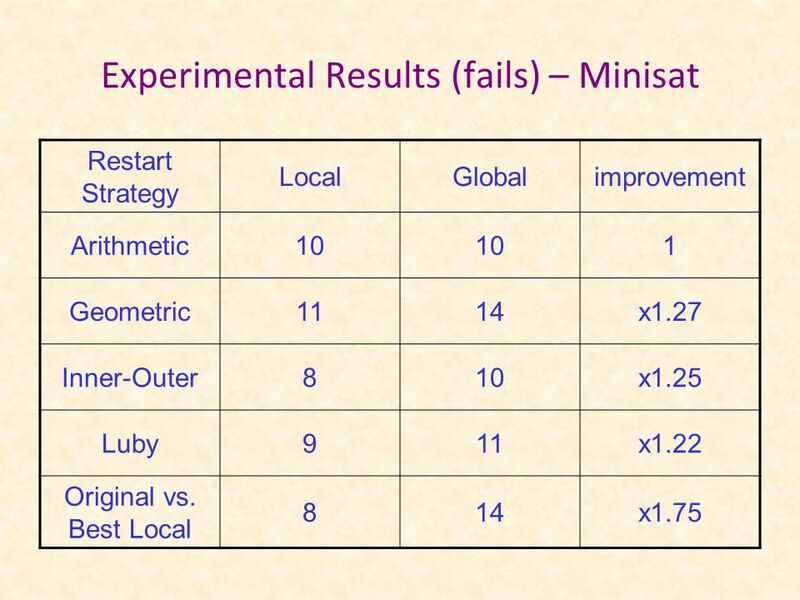  All the presented strategies can be local. 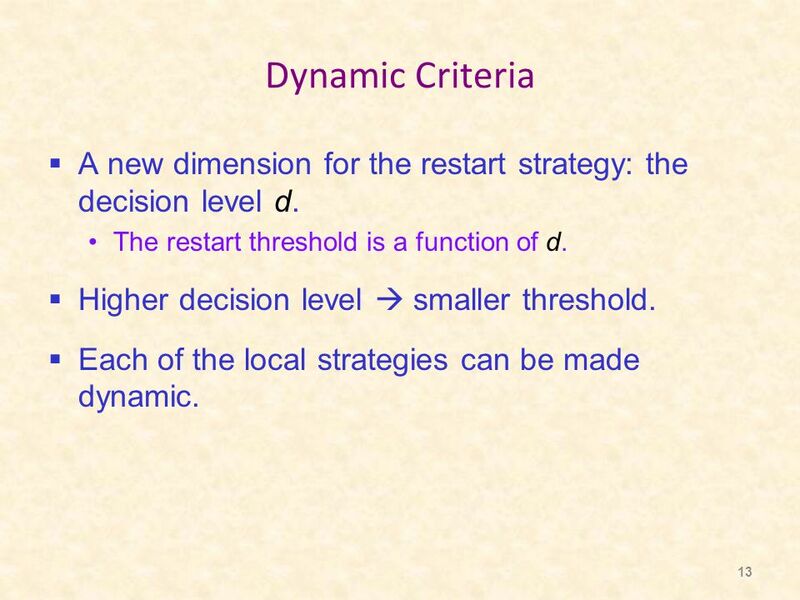 13 13 Dynamic Criteria  A new dimension for the restart strategy: the decision level d. The restart threshold is a function of d.  Higher decision level  smaller threshold. 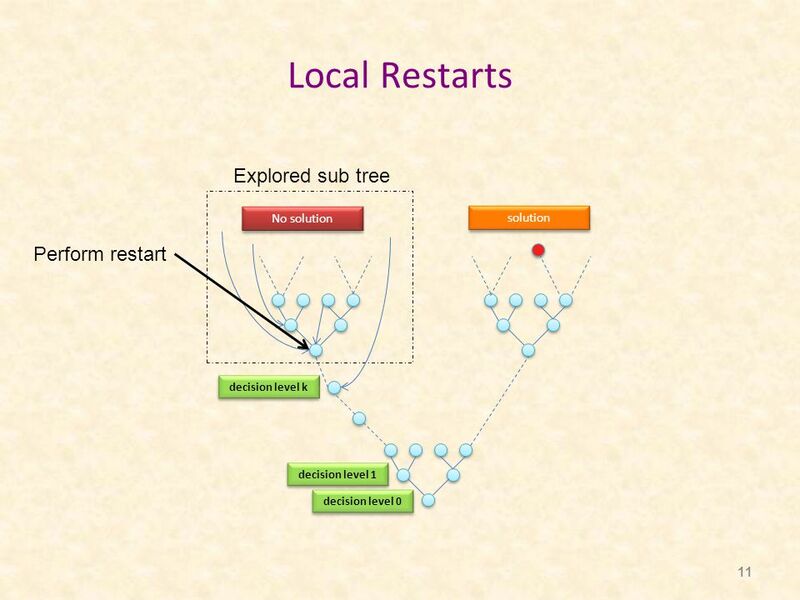  Each of the local strategies can be made dynamic. 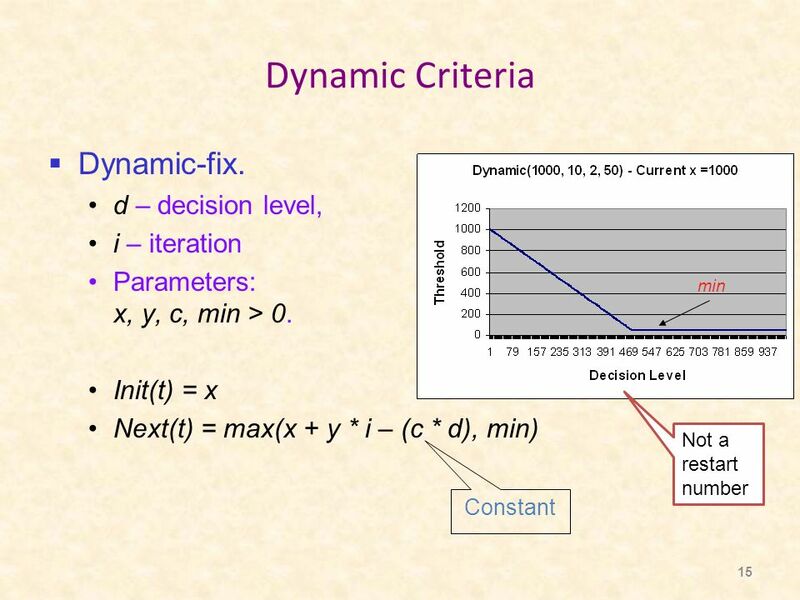 14 14 Dynamic Criteria  Dynamic-fix. 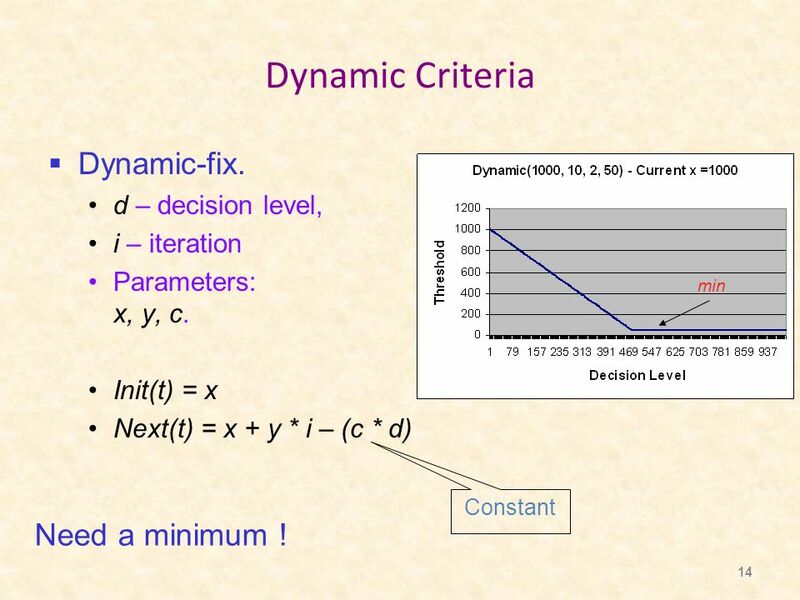 d – decision level, i – iteration Parameters: x, y, c. Init(t) = x Next(t) = x + y * i – (c * d) min Constant Need a minimum ! 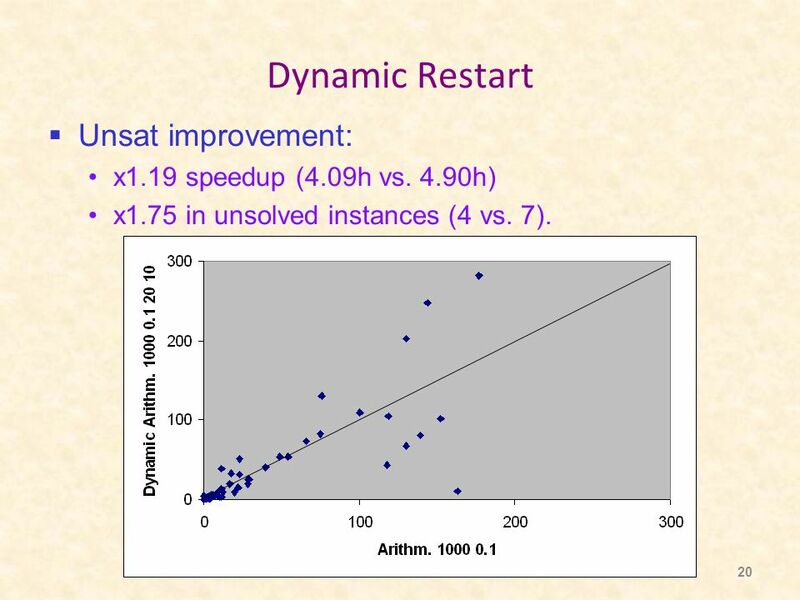 20 20 Dynamic Restart  Unsat improvement: x1.19 speedup (4.09h vs. 4.90h) x1.75 in unsolved instances (4 vs. 7). 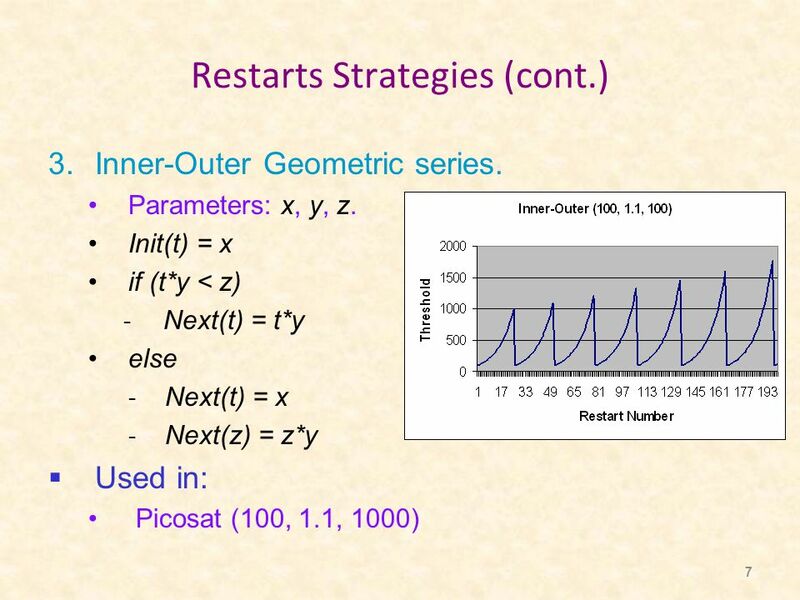 Download ppt "1 Local Restarts in SAT Solvers Vadim Ryvchin and Ofer Strichman Technion, Haifa, Israel." 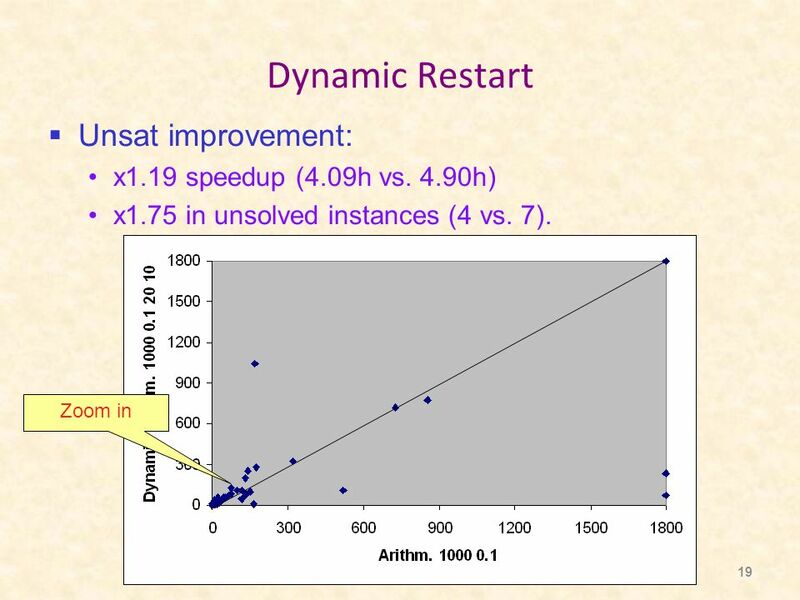 Hybrid BDD and All-SAT Method for Model Checking Orna Grumberg Joint work with Assaf Schuster and Avi Yadgar Technion – Israel Institute of Technology. Introduction to Formal Methods for SW and HW Development 09: SAT Based Abstraction/Refinement in Model-Checking Roberto Sebastiani Based on work and slides. 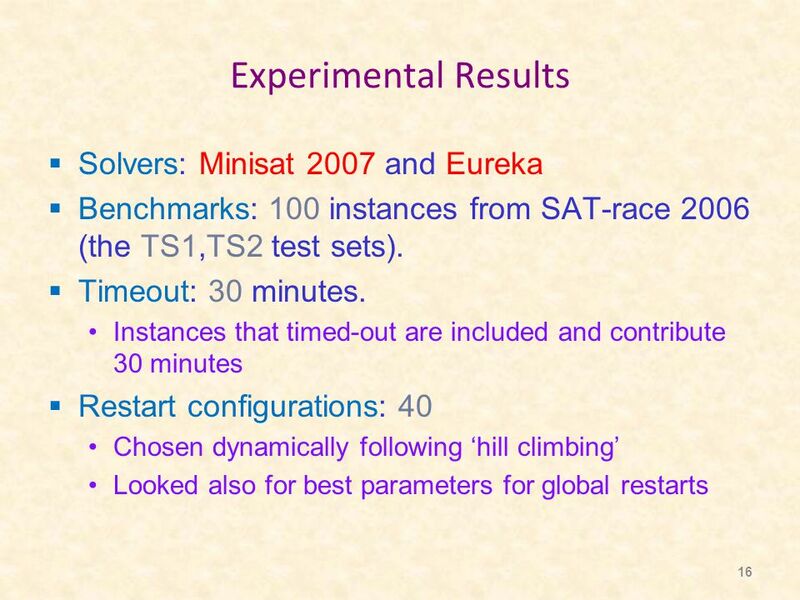 Solving Difficult SAT Instances Using Greedy Clique Decomposition Pavel Surynek Faculty of. Data Structures for SAT Solvers The 2-Literal Representation Gábor Kusper Eszterházy Károly College Eger, Hungary. Daniel Kroening and Ofer Strichman 1 Decision Procedures An Algorithmic Point of View SAT. 1/30 SAT Solver Changki PSWLAB SAT Solver Daniel Kroening, Ofer Strichman. IBM Labs in Haifa © 2005 IBM Corporation Adaptive Application of SAT Solving Techniques Ohad Shacham and Karen Yorav Presented by Sharon Barner. 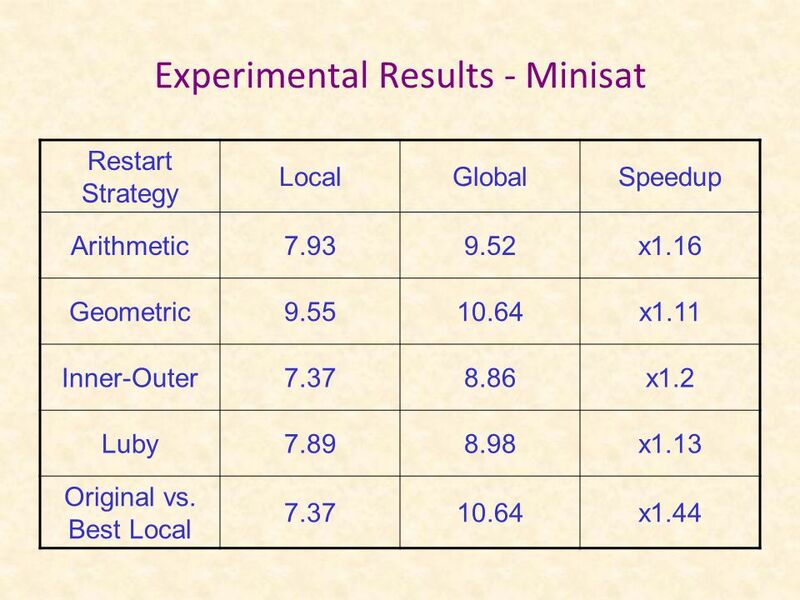 A Scalable Algorithm for Minimal Unsatisfiable Core Extraction Nachum Dershowitz¹ Ziyad Hanna² Alexander Nadel¹, ² 1 Tel-Aviv University 2 Intel SAT’06. 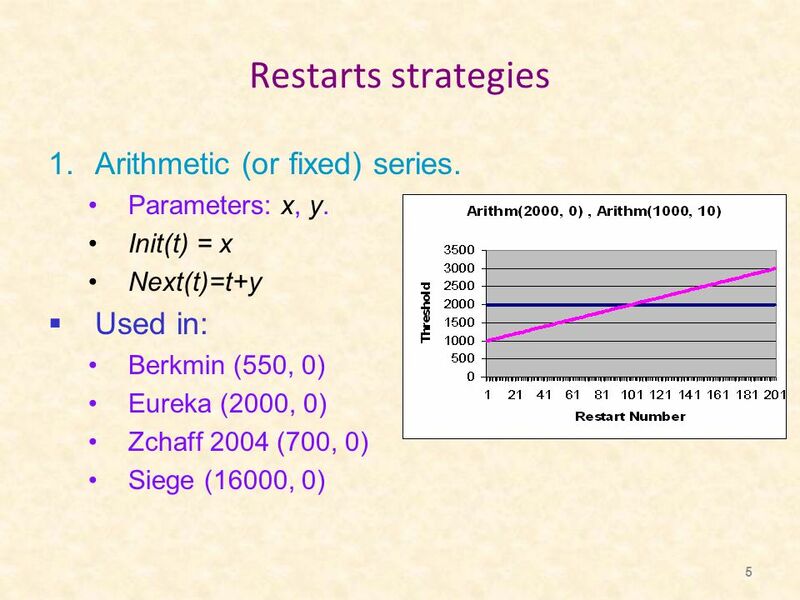 On the Potential of Automated Algorithm Configuration Frank Hutter, University of British Columbia, Vancouver, Canada. Motivation for automated tuning. B ACKTRACK SEARCH ALGORITHM. B ACKTRACKING Suppose you have to make a series of decisions, among various choices, where You don’t have enough information. © 2002 Fadi A. Aloul, University of Michigan PBS: A Pseudo-Boolean Solver and Optimizer Fadi A. Aloul, Arathi Ramani, Igor L. Markov, Karem A. Sakallah. ECE 647 TERM PROJECT MiniSAT parallelization Shahadat Hossain Saud Wasly. Efficient SAT Solving Under Assumptions Alexander Nadel 1 and Vadim Ryvchin 1,2 1 – Intel, Haifa, Israel 2 – Technion, Haifa, Israel SAT’12, Trento, Italy.